Here in the United States, 41% of children under of the age of 18 years are part of low-income or poor families. According to the 2016 federal poverty threshold statistics, a family of four (2 parents and 2 children) with a household income of $48,678 or less is considered low-income, while a family of four earning $24,339 or less is considered poor. Childhood poverty can impact students socially, emotionally, and academically. When I was in middle school, my parents divorced and my family of three (my sister, my mom, and me), slipped into the “low-income” status. When I think back to this period of my life in the 1990s, what still stands out is: The F on my report card that I earned in social studies, the coveted Guess jeans and Esprit bags that I couldn’t afford, and pink lunch tickets. This was a time before electronic lunch cards existed and we had to purchase individual paper tickets for lunch every week. Up until that time, my lunch tickets were green. I felt demoralized when the lunch lady told me I qualified for a “reduced lunch rate” and handed me the pink tickets. Why did the tickets have to be a different color? I wanted the green tickets - I just wanted to blend in and feel normal. My story is minor compared to the challenges millions of other children have faced or are facing today. Unlike the 4.2 million children who experience homelessness each year, I always had a safe place to live. And, unlike the 12 million children today who are food insecure, I always had plenty of food to eat. Like millions of children, however, my circumstances still impacted me socially, emotionally, and academically. 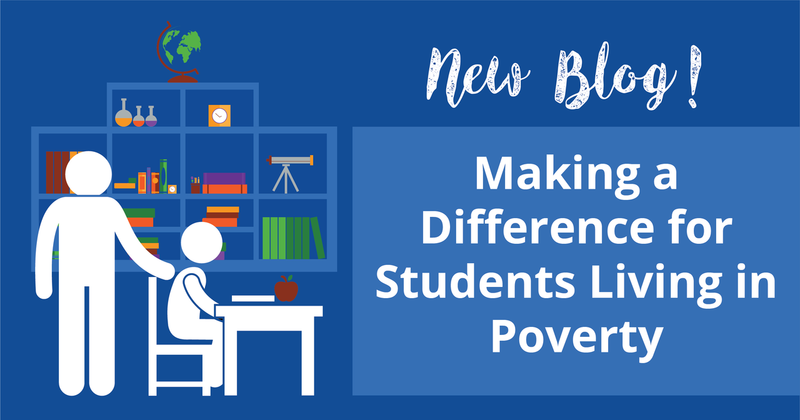 Poverty can seem like a daunting problem, but we, as educators, can take steps – small and big - to make a difference in the lives of our students. Begin here by learning about the misconceptions associated with children and families living in poverty and how our perceptions can shape students’ educational experiences. Have high expectations of your students and encourage them to set short and long-term goals. The students in this video were invited to set “gaudy goals” – goals that inspired them to shoot for the stars! Listen to this award-winning teacher explain why we need to rethink the way we teach our students about poverty - for the betterment of all students. Watch and share the ‘Homework Gap’ to understand the disadvantages of and the challenges faced by the children in 5 million households without internet service. Finally, be inspired by this former teacher in Florida who works to provide essentials for children in need, such as personal hygiene products, clothing, school supplies, and most importantly - hope. Interested in learning more about how to make a difference for your students living in poverty? Register for our online course: Reaching At-Risk Students and Underachievers.